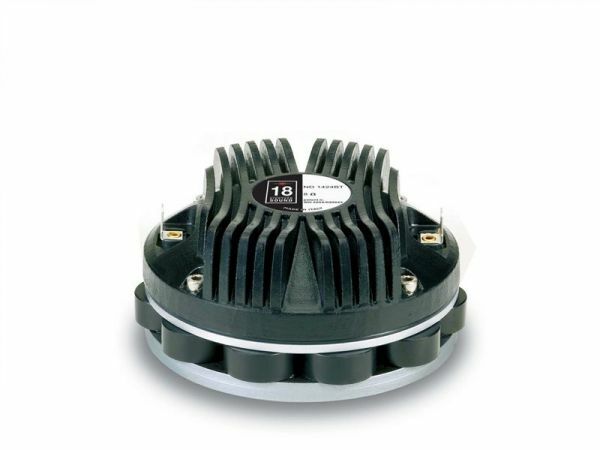 Produktinformationen "18s ND1424BT 8 Ohm"
The ND1424BT 1.4" exit neodymium high frequency compression driver has been designed for high level sound systems application. The titanium diaphragm is produced in house and has been developed to assure unmatched transient response. A proprietary treated Nomex bended former edge-wound aluminum 60mm voice coil completes diaphragm assembly. It has been made joining the proprietary treated Nomex former directly to the titanium dome through its upper bend edge. In comparison with usual straight former joint, the driver design assures extended frequency energy transfer for improved response linearity and unparallel reliability. This feature allows to keep proper motion control of the dome in real working conditions. Thanks to its physical properties, the proprietary treated Nomex former shows 30% higher value of tensile elongation at working operative temperature (200°C) when compared to Kapton. Moreover, this material is suitable to work also in higher moisture contents environments. Equipped with Proprietary Phase Plug 3P architecture, the ND1424BT has been designed to give smooth coherent wavefront in the horn entrance in all working frequency range and high level manufacturing consistency. The phase plug with its short openings and high flare rate value assures low distortion and remarkable improvements in mid-high frequency reproduction. Another big innovation in ND1424BT consists in the magnetic complex architecture. Through careful use of elementary pieces of neodymium magnets, Eighteen Sound engineers have developed a powerful neodymium magnet assembly able to reach 19KGauss in the gap in compact and lightweight structure. The motor structure, throughout the precisely coherent phase plug with 3 circumferential slots and copper ring on the pole piece, reduces inductance effects and distortion. The custom designed O-ring creates a tight seal between the plate and the cover assuring air chamber loading. Excellent heat dissipation and thermal exchange are guaranteed by the direct contact between the magnetic structure and the aluminum cover that allows to obtain a lower power compression value. Weiterführende Links zu "18s ND1424BT 8 Ohm"
Kundenbewertungen für "18s ND1424BT 8 Ohm"